Within this resealable bag lies a blend of single-origin Hom Mali rice harvested by passionate rice farmers in a province, Sisaket that’s located in the North-east of Thailand. The seasonal climate of this region and inland nature of the rice plains give the rice its signature nutty flavour and al-dente texture. Naturel Organic Rice is certified organic by IFOAM and European Union. 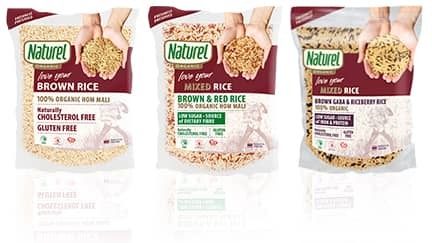 Naturel Organic Rice is naturally cholesterol free and gluten free. One serving of rice (150g) = 300% daily wholegrain requirement.